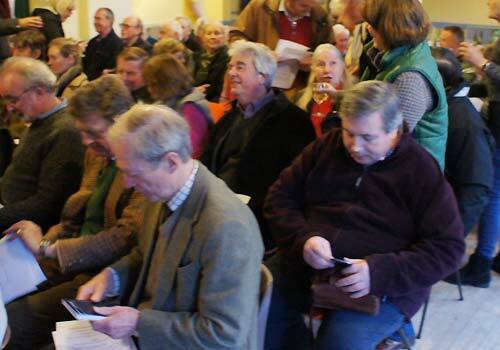 The 2015 Annual Village Meeting, held in the Village Hall on April 1st, was well supported this year, possibly the last time the meeting will be held in Massey's Folly. 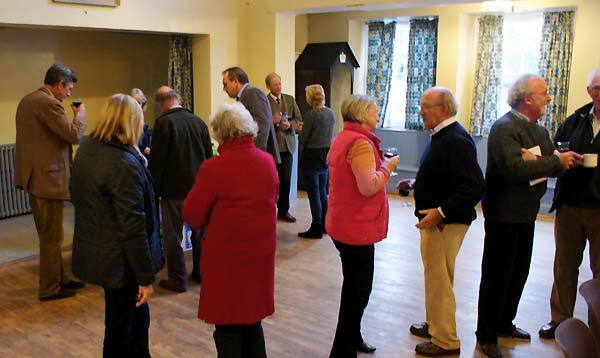 The wine and refreshments on offer may have provided an incentive for those wondering whether to venture out but, whatever the motive, a fair cross-section of Residents turned out to attend what could prove to be the last Village Meeting held in Massey's Folly. The Farringdon Parish Councillors were all present at some time during the evening, although being a working day there were one or two late arrivals due to work commitments. 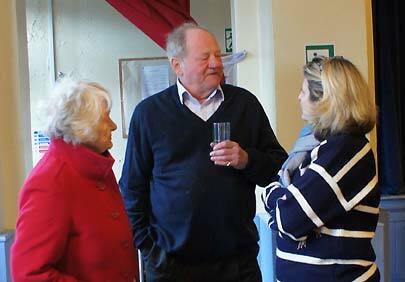 Representing Farringdon Neighbourhood Watch was Co-ordinator Bob Chase,seen here in discussion with Farringdon Parish Clerk Emma Dillnut (right) and Gillian McCallum. Mark Kemp Gee, H.C.C. and Patrick Burridge Chairman E.H.D.C. East Hants District Council Chairman Patrick Burridge and Hampshire County Council Representative Mark Kemp-Gee were also in attendance as was Area Police Commander Beth Pirie. 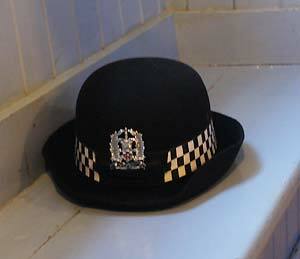 Apologies, (again) there should have been a picture of Commander Pirie here but despite repeated warnings the 'Biz' photographer had gained access to wine at this point and the already mediocre photographic skills were further diminished, to the point where we only have a picture of the Commander's hat. 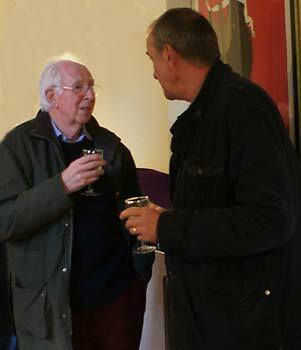 Patrick Fuller, (seen here on the right chatting to Ian Dussek) was in attendance as Editor of the Farringdon and Chawton Parish Magazine, an exceptionally fine and honourable organisation which sponsors both the 'Biz' and Chawton Village web site) although the sponsorship of the 'Biz' photographer is under revue. At this point there seems to have been an outbreak of line dancing, or possibly a mass attempt to avoid eye contact with the 'Biz' photographer, whose notes had by now become indecipherable. 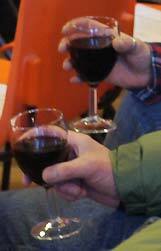 Normal order was soon restored and the audience took their seats for the evening ahead. This will be the last public meeting of the current line-up of the Farringdon Parish Council. You may have noticed that a General Election is imminent and our Local and Parish Council elections will also due be held on the same day, although in the case of the Parish Council there will only be an election if there are more candidates than the number of seats available. Hampshire Police Area Commander Beth Pirie, East Hants Chairman Patrick Burridge and Hampshire County Councillor Mark Kemp-Gee were also given an opportunity to address the meeting before questions from the audience, the majority of which centred on two topics, traffic and the planning application to build on the Paddock on the Eastern side of Crows Lane. There was a general consensus that the mobile speed camera should appear more often on the A32 and there were various opinions on where it should be sited to catch the most serious offenders. Commander Bath Pirie also clarified the apparent confusion over the refusal to permit a proposed Speed Watch group to monitor traffic along the main Gosport Road. Views on setting up a Speed watch campaign in the Village were mixed as the majority of the audience appeared to be more concerned about speed in on the main road rather than the Village lanes. 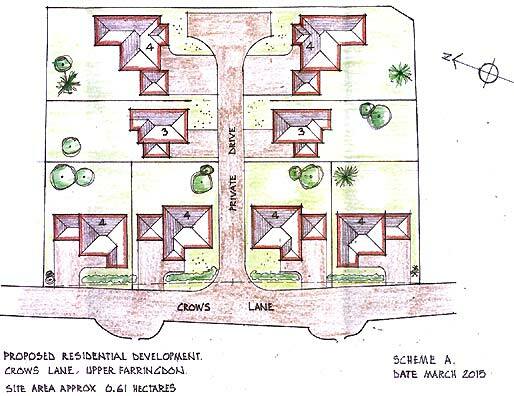 The alternative plan offered is for 8 Houses with integral parking spaces, sufficient to make it a viable proposition to develop the site but avoiding the inevitable congestion and parking problems which would result if 14 dwellings were crammed into the available area. The plan was well received by the majority of those present and it remains to be seen whether it will be equally well received by the various owners of the Paddock. if you have any comments or queries on this initiative your input would be welcome by email to John Prynne. of Farringdon Parish Council meetings Parish Notices and Parish Business will be available for your perusal. but the archive of Farringdon Parish Council reports currently carried on the Parish Pages will be cleared to allow a revamp and updating of the Farringdon Village Web site in the coming months.